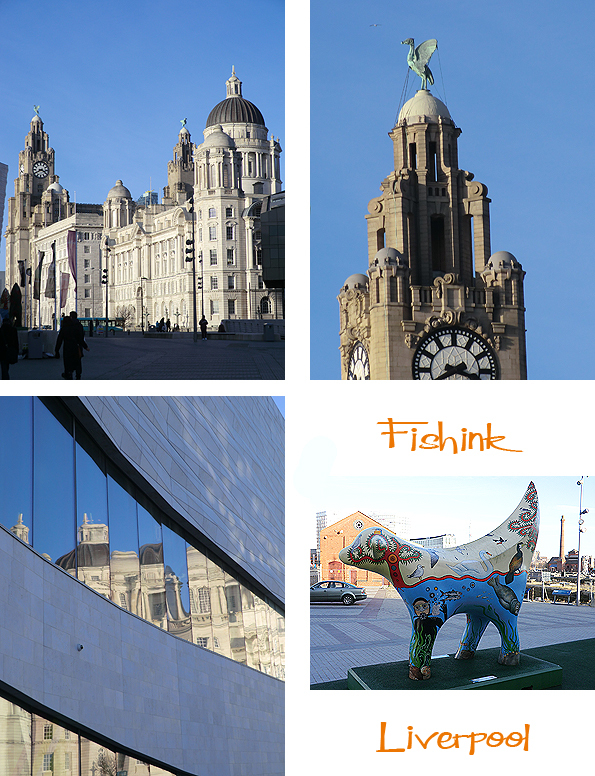 Fishink in Liverpool. 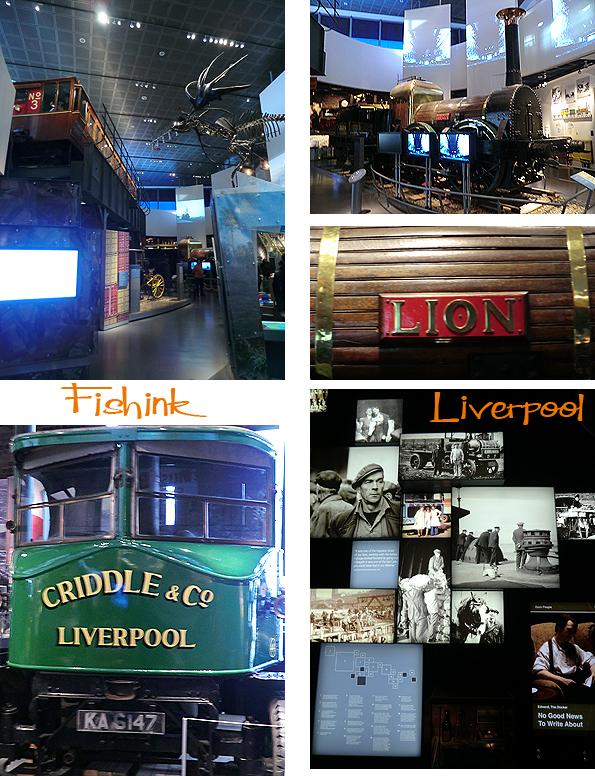 FACT and The Museum of Liverpool. These images from the FACT site show better than mine what was going on. Through the ceiling lights, artist Edwin van der Heide creates performances and environments alive with the elemental. They immerse the viewer and play with their perception of space. 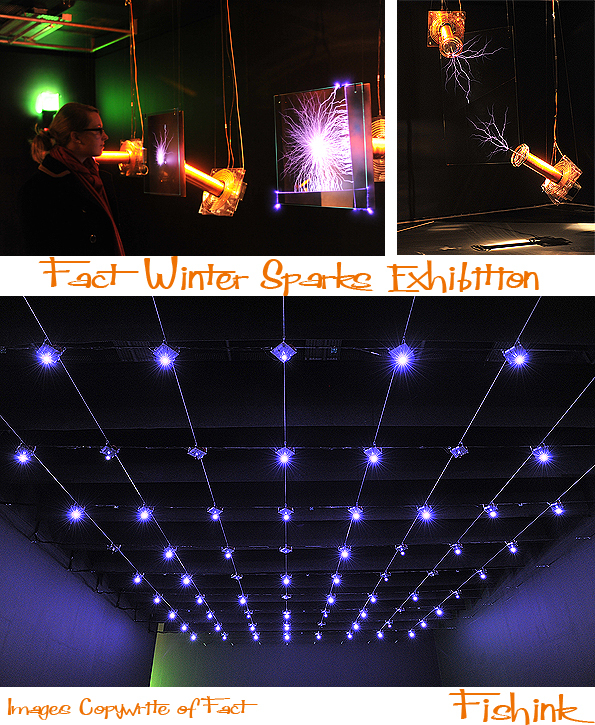 His ‘Evolving Spark Network‘ consists of a grid of electric sparks that hovers above the whole exhibition space, flashing like stars in the dark winter sky. These sparks act as a metaphor for the electrical impulses by which our nerves communicate information: just like neurons that form links in our body, the spark bridges form an interconnected network. The three-dimensional nature of the composition engages the visitors and makes them part of the spatial dialogue. The electric discharge produces both sound and light resulting in the distinct visual and sonic qualities of the generated patterns: the unmistakable, brief static flashes of energy. The sonic quality in this spellbinding display unifies and transforms the space and results in an absorbing, multi-sensory experience. It was quite a performance ! 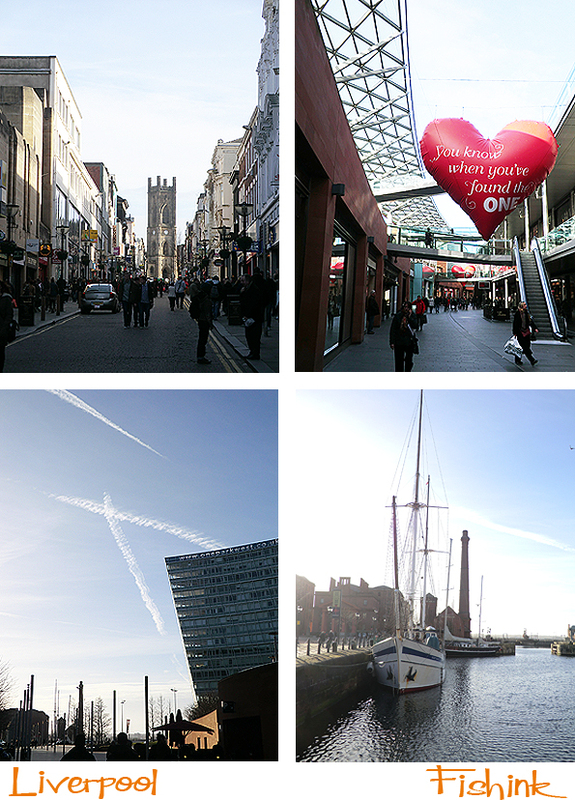 After all that energy we took a stroll through a beautifully sunlit Liverpool One and headed down to the Albert Docks for a great lunch in the Pump House followed by a two hour dip into the Museum Of Liverpool, as opposed to the Liverpool Museum, which is now called the World Museum. Renamed, I guess to stop any confusion between the two. (What ?). The architecture and tall ships looked quite splendid. We even gave a nod to Billy Fury standing there looking like Elvis. According to the sign, Billy was one of the most famous stars of British Rock and Roll, born in 1940. He used to work on the mersey tug boats and taught himself to play the guitar and write songs. Apparently his total record sales were on a par with Cliff Richard and The Beatles ! Wow. We took in the gleaming Liver Buildings and as always I can’t see the statues on top without singing (in my head) the theme tune to The Liver Birds. 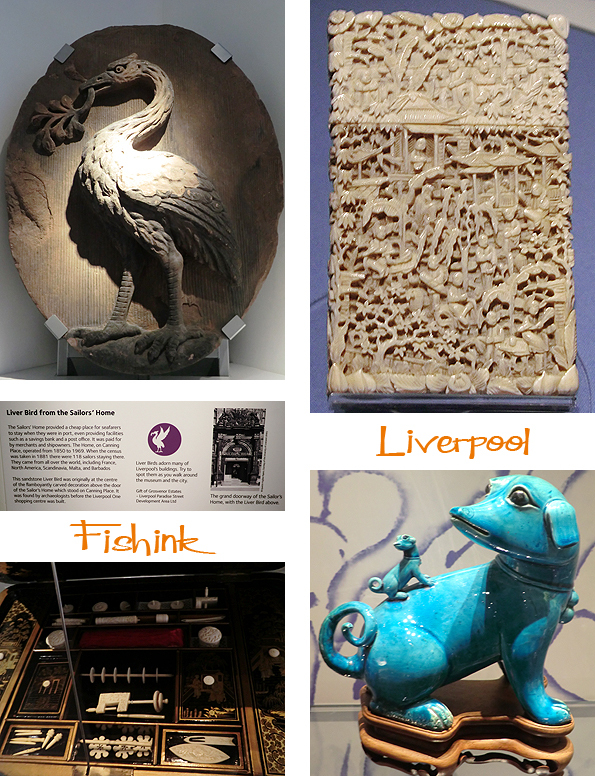 The modern popularity of the bird symbol largely dates back to 1911, when the Liver Building was built. 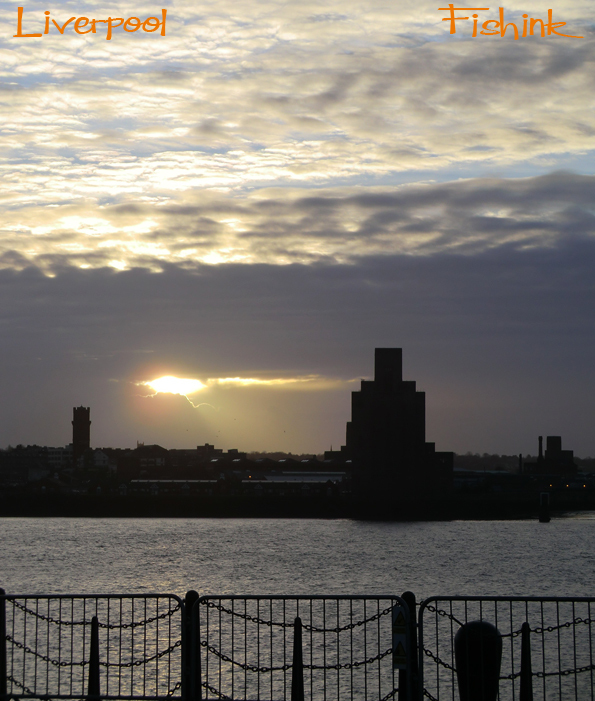 This prominent display of two liver birds rekindled the idea that the liver was a mythical bird that once haunted the local shoreline. According to popular legend, they are a male and female pair, the female looking out to sea, (watching for the seamen to return safely home) whilst the male looks towards the city (making sure the pubs are open). An alternative version says that the male bird is looking in to watch over and protect the families of the seamen. Local legend also holds that the birds face away from each other as, if were they to mate and fly away, the city would cease to exist. 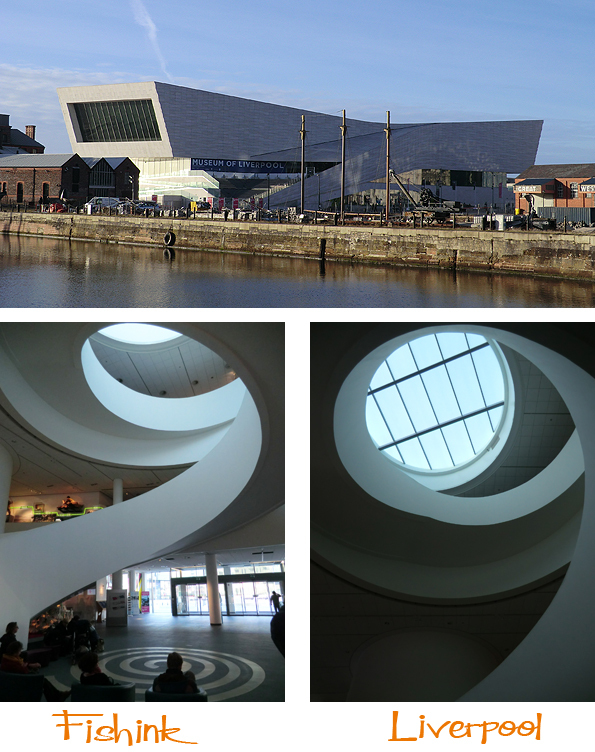 The Museum of Liverpool opened on 19 July 2011 in a purpose-built landmark building on Liverpool’s famous waterfront. Since then it has won a number of awards, most recently the Council of Europe Museum Prize for 2013. The council state that ‘The museum traces the social, economic and political history of a city which is one of the most socially diverse in Britain. It has an outstanding capacity to get people of all ages, backgrounds and abilities involved and promotes in a strong and convincing form Council of Europe core values and the importance of “living together in dignity”. It certainly is a beautiful building, I like the bold, angular exterior which sharply contrasts with the smooth and curvaceous interior. 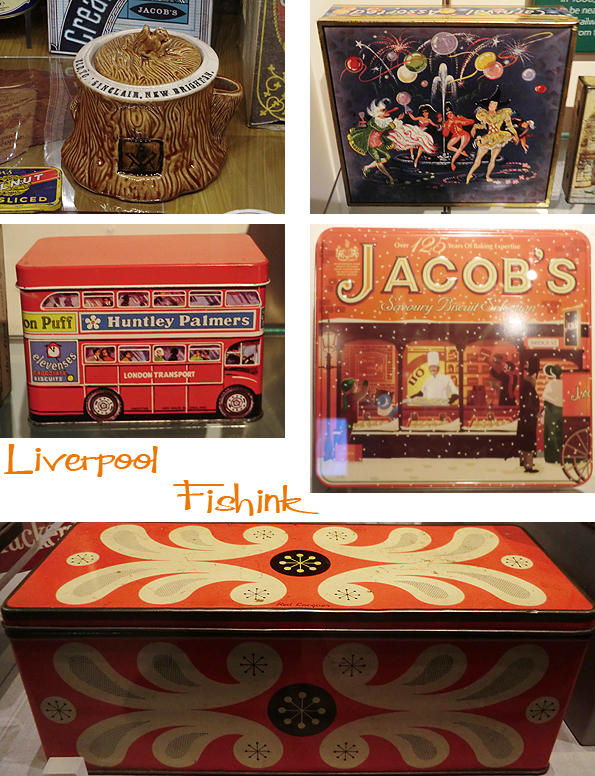 It talked about the Liverpool area and how it developed. 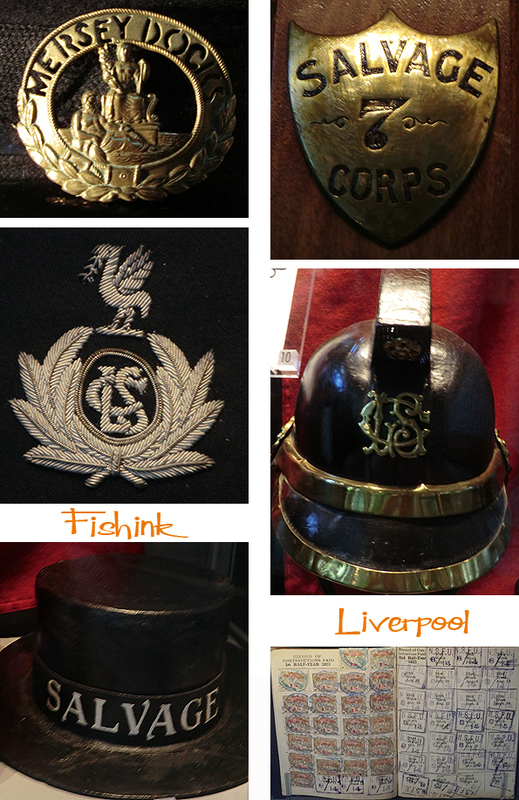 We looked at an exhibition about Liverpool’s trade links with Singapore and some artefacts that came to the city at that time. Not the Liverbird, which was saved from the old Sailor’s Home which provided seafarers with a cheap place to stay whilst they were in the city and ran from 1850 to 1969. 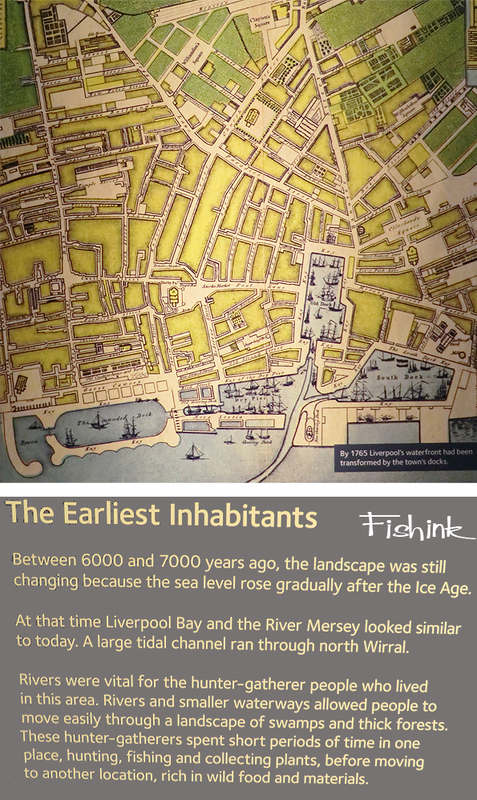 Archaeologists found the plaque more recently before the Liverpool One shopping precinct was built. 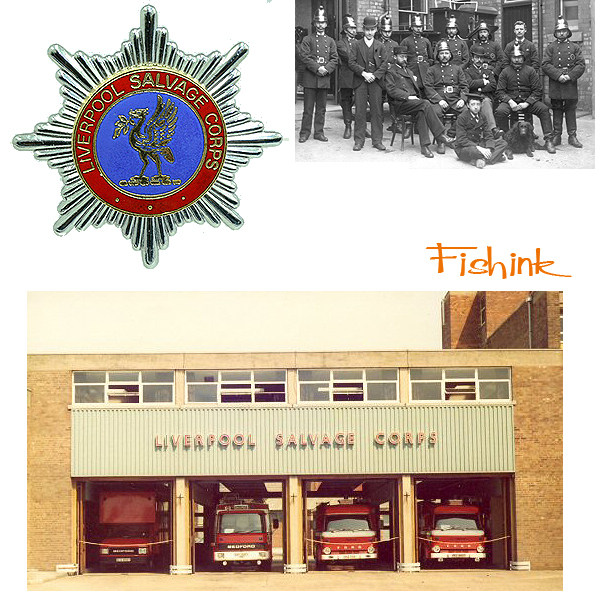 The Liverpool Salvage Corps were established in 1842, with a view to reducing the loss and damage of good held in the warehouses. They were like the local fire and police of the day. The “Lion” is one of the world’s earliest surviving railway locomotives. Built in Leeds in 1838, to run on the recently opened Manchester to Liverpool Railway. 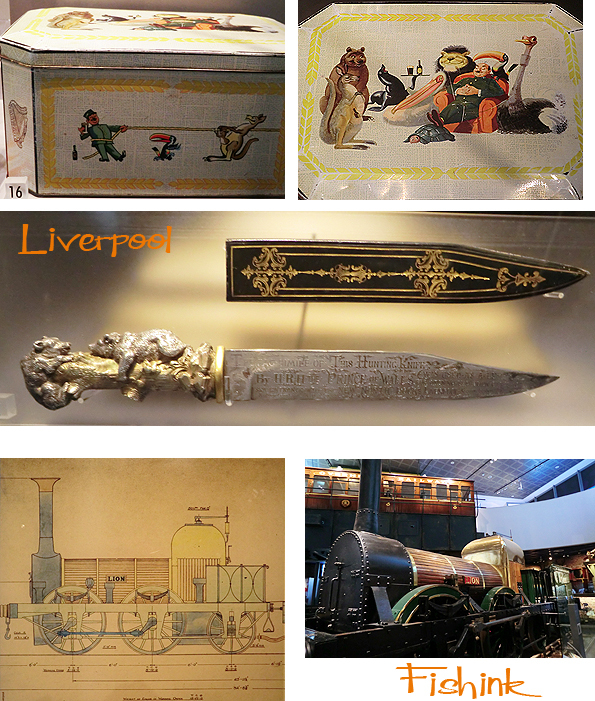 This exhibition concentrated on the type of goods that were being imported into the cities large and thriving port. Tea and sugar being two items. 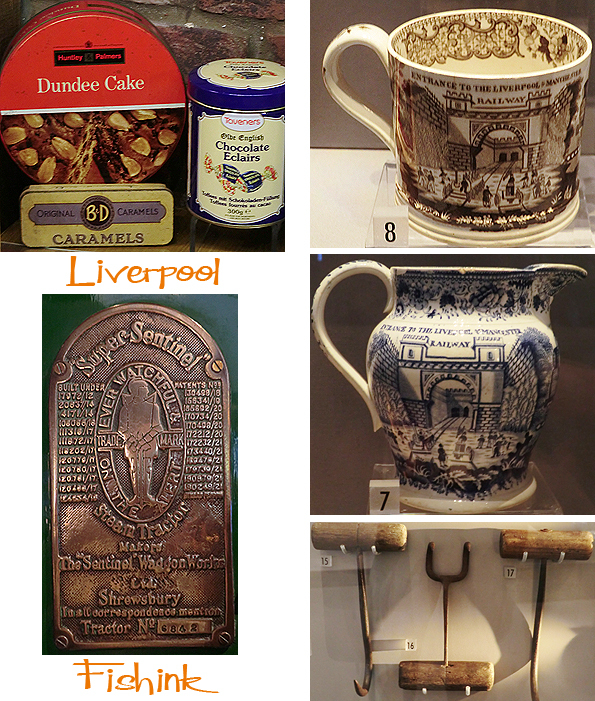 A great collection of old tins and ceramics to show the entrance to the Manchester and Liverpool Railway. Also (above) some ‘Dockers hooks’ which were the main tools of the dockers. A cargo handling was a specialised job, different hooks were needed for different crates and cargos. For example ‘Scratcher hooks’ had a flat head with metal brads which allowed them to grip tightly packed cargo without damaging the packaging. As we only had a couple of hours in the museum and briefly touched on what was displayed on the ground floor, we’ll definitely be heading back in the near future to see more of the other three floors. I hope this may also inspire you to visit. A beautiful space and a great day out. 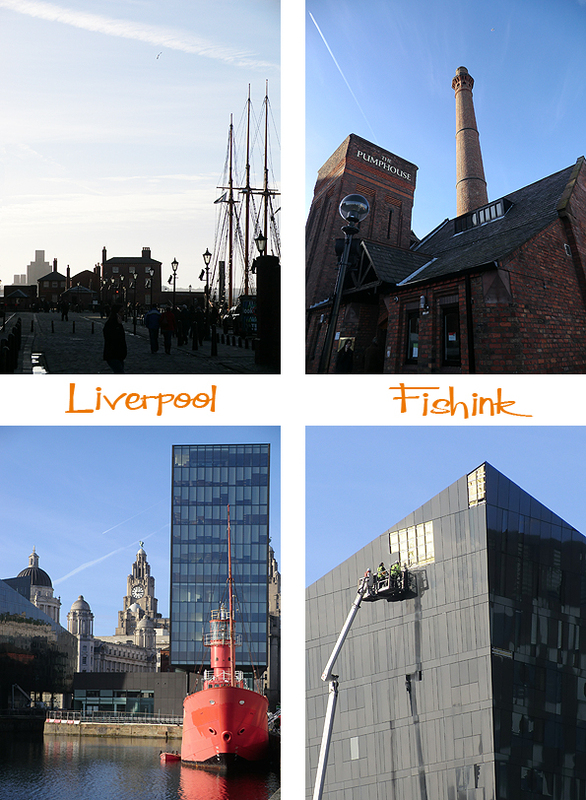 That was being built when we were last there- some great museums in Liverpool. Have to go back. Billy Fury was very ‘dishy’ – all cheekbones and brooding eyes. lol I’m guessing he had that certain ‘something’ to sell all of those records. Makes mental note to play some Billy Fury tracks. 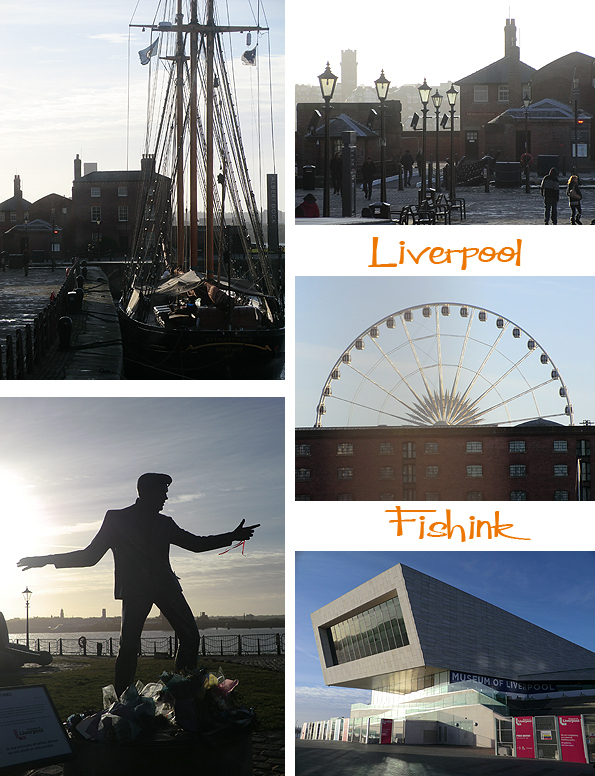 Yes Liverpool is well worth a return visit. 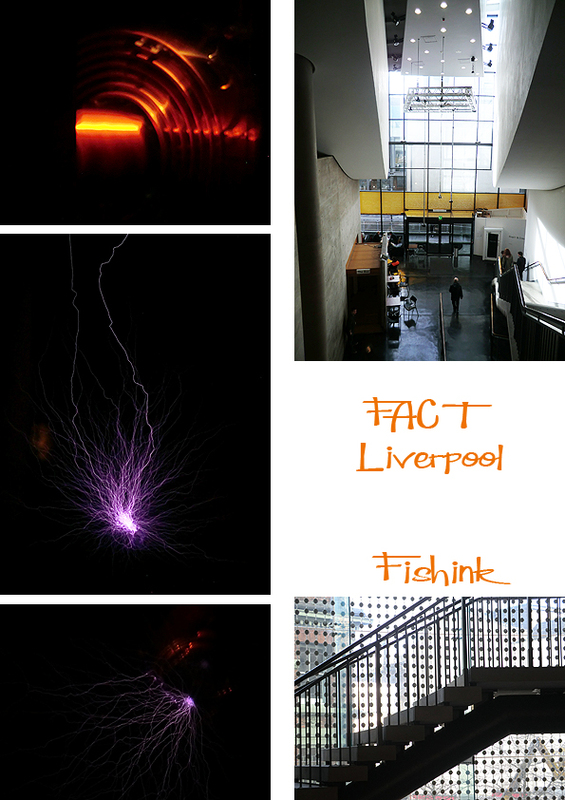 Electricity, interact … 🙂 I like museums where you can also see, touch, feel, experience … A full day. I’m glad to say that more modern museums seem to be going in this direction.